“Greed is good.” So said Gordon Gecko in the 1987 film about 1980s excess, WALL STREET. As much as we love to snicker as actor Michael Douglas delivers that line, many of us believe it. If we didn’t, there wouldn’t have been people like Ivan Boesky, Bernie Madoff, Nick Leeson, Martha Stewart and scores of others who have either been sent to prison or, as is the often the case up north, to their death. It’s because we generally believe that greed is good that the subprime mortgage crisis happened. In the years leading up to 2007, banks and mortgage companies were pretty much giving money away to new home buyers. These sweet deals included the requirement for little or no down payment, and adjustable interest rates that often had a “honeymoon” period where the rate was either at or below prime. No credit? No problem. Some mortgage companies even offered prospective homebuyers so-called “ninja” loans – no income, no job and no assets. At the same time, finance companies were giving out credit cards like they were lottery tickets, often with the same conditions the mortgages had. In 2006, the average American had 13 credit obligations on record and a typical family’s debt was 27% larger than its disposable income. Greed was in full swing. Meanwhile, the major financial firms had to do something with all those mortgages. They decided to bundle the dodgiest of them in with a few good assets and sell the whole thing, called mortgage-backed securities, as secure investments. The ratings agencies were complicit in the deception too, as they were the ones that gave these financial instruments such high ratings. Individuals and pension and investment funds were buying up these MBSs because they believed they offered a good rate of return for little risk. But that wasn’t the reality at all. When interest rates rose further, companies downsized, and people lost their jobs and were unable to pay their debts. Mortgages went into default, house prices fell and, with them, the value of those so-called “safe” investments. The financial institutions with the greatest exposure went bankrupt and everyday people lost their retirement savings as the value of their investment plans shrunk. The house of cards collapsed and no one saw it coming. Well, a few people saw it coming and that’s what THE BIG SHORT is all about. The story follows four groups of “outsiders” who decided to stick it to the greedy banks and bet against them. But, by doing so, they were also betting against America, which isn’t a very American thing to do. 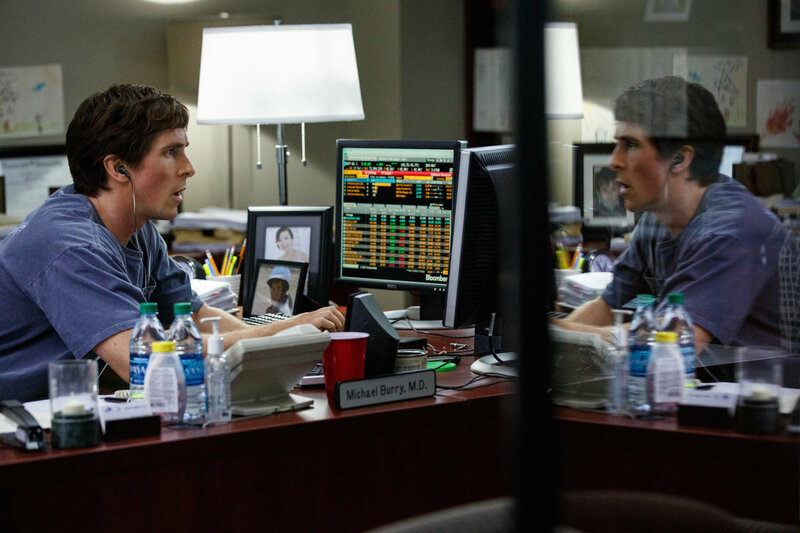 Leading the pack was Michael Burry (Christian Bale, EXODUS: GODS AND KINGS; AMERICAN HUSTLE), a doctor who gave up practicing medicine to run a small hedge fund. In 2005, he was so convinced that the credit bubble would burst in 2007 that he shorted the market to the tune of over a billion dollars. Mark Baum (Steve Carell, FOXCATCHER), a Connecticut-based manager of a fund under Morgan Stanley’s umbrella, also bet against the market as did trader Jared Vennett (Ryan Gosling, DRIVE) and young investors Charlie Geller (John Magaro, CAROL) and Jamie Shipley (Finn Wittrock.) Retired banker Ben Rickert (Brad Pitt) joined in at the request of Geller and Shipley who needed Rickert to “bring them to the [big boys’] table”. Companies like Goldman Sachs were eager to sell all these guys credit default swaps because they thought the good times would never end. Don’t worry about all the jargon being thrown around in the movie. Co-written and directed by Adam McKay, who is known for his Will Farrell films (ANCHORMAN; TALLADEGA NIGHTS), THE BIG SHORT takes Michael Lewis’ 2010 best-selling book of the same name and successfully balances the complexity of the subject matter with comedic nuggets that are mined to their full worth. Various pop culture celebrities pop up throughout the film to slow the film’s breakneck pace down by explaining financial terms in language that even an 8-year-old would understand. Vennett, too, breaks the fourth wall, as the story’s narrator, making sure the audience doesn’t get bogged down in the confusion. The result is a work that is entertaining, educational and tragic, all at the same time. Once again, Bale throws himself headlong into his character and he finds plenty in Dr. Burry, whose quirkiness would indicate Asperger’s Syndrome, which Burry himself now suggests he has. Carell, too, is equally impressive as the emotionally and morally tortured Baum. He shows us that his riveting performance as John du Pont in FOXCATCHER was no fluke. THE BIG SHORT is a great film and well deserving of the accolades it is receiving. We shake our heads in disbelief at the voracious greed that was allowed to run rampant from Wall Street all the way down to Main Street and we are happy when Burry and the others give the investment banks their just due. But then we remember the thousands of lives that were destroyed in the process and all the bank executives who evaded jail time, and we go back to shaking our heads in disbelief again.